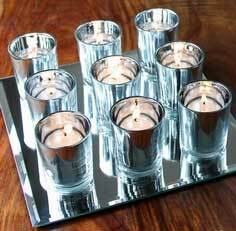 Blendboutique also stocks the coloured mirror 'mocha' holders at £7.95 (I'm assuming for the set of four in green, red, blue and bronze - shown left), and this set of nine blue mirrored glass tea light holders on a mirrored plate for £15.95. Closest to the candle holders featured in the original article is this set of hanging holders from the Orchard that are very similar (below). The set of six is £12 and colours included are gold, red, green, blue, fuschia pink and purple, with silver mirrored glass outers. 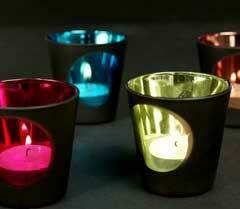 The Orchard also sell a set of four mercury glass votives with a scalloped edge for £19, shown below. 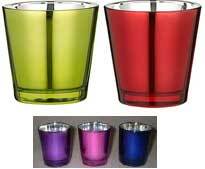 Lastly, here's a few that have the colour on the outside, with the silver mirrored glass on the inside (pictured below). The top two in green and red are from John Lewis and are £3 each. 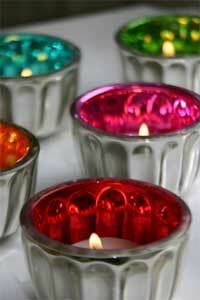 If you're after a cheaper option you can't go past these brightly-coloured votives from Northern Lights (to find them on their rather basic website, go to Candle shop > Holders > Votive Holders, and scroll about a third of the way down the page). They're cheap as chips at just £1. They don't say whether that's each or for a set of three, but my guess is that's the individual price. amazing pictures. i have to get my hands on a few of these. 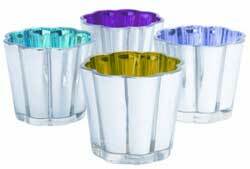 honestly I don't like these metallic colors, I prefer the traditional cups. Sometimes I think that our own offenses should seem so much less heinous than the offenses of others. I often feel confused. 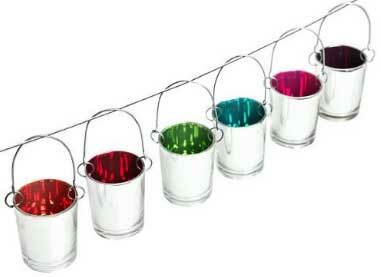 The holders are so beautiful and so colorful. It will make a great effect on wherever place it will be. I wonder if its at dark will it light in its each color?